We aim to identify patients at risk for post-operative urinary retention (POUR) and factors associated with POUR. 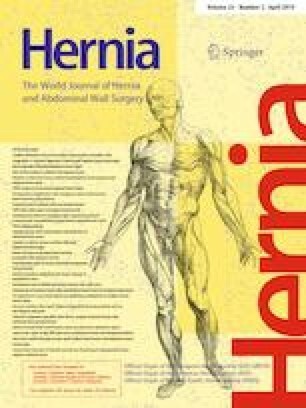 Males who underwent inguinal hernia repair (IHR) from June 2010 to September 2014 at a single institution were grouped according to the presence (symptomatic) or absence (asymptomatic) of preoperative urogenital symptoms (UGS). Patients ≤ 18 years of age were excluded. POUR was defined as the need to catheterize a patient who had not voided 6 h after surgery. Data were examined using IBM SPSS v23.0. Of the 60 asymptomatic and 30 symptomatic patients identified, no differences were seen in age (55 vs. 65, p = 0.13), length of stay > 1 day (3% vs. 13%, p = 0.09), bilateral inguinal herniation (23% vs. 23%, p = 1.00), or laparoscopic approach (70% vs. 69%, p = 1.00); however, significant differences were seen in POUR (5% vs. 27%, p = 0.01) and α-blocker utilization (50% vs. 80%, p = 0.01). When age-matched, neither POUR (10% vs. 27%, p = 0.10) or α-blocker utilization (57% vs. 80%, p = 0.05) significantly differed between asymptomatic and symptomatic patients, respectively. Logistic regression analysis demonstrated that only bilateral inguinal herniation (OR 6.55, p = 0.03) and symptoms (OR 6.78, p = 0.02) were associated with POUR. Asymptomatic patients with a unilateral hernia have a 4.3% risk of POUR, whereas symptomatic patients with a bilateral inguinal hernia have at 57.1% risk. We demonstrate that bilateral inguinal herniation and UGS independently increase the risk of POUR, whereas α-blockers do not. For the general surgical population, α-blockers should not be routinely prescribed to all patients and instead should be limited to high-risk patients. Funding for this study was provided by the Center for Advanced Surgical Technology at the University of Nebraska Medical Center. BRH was responsible for writing of the manuscript with the assistance of PRA who is also responsible for all statistical analyses. BG was responsible for data collection and clinical input. DL was responsible for initial data collection and preliminary analysis. DO was responsible for oversight of the project, clinical input, and takes responsibility for article submission. Authors BH, PRA, BG, and DL declare no conflict of interest. DO is a shareholder in Virtual Incision Corporation, and received Research Grant not related to the submitted work from Medtronic and Gore. All study procedures for this single-center retrospective study were reviewed and approved by the UNMC Institutional Review Board. This study including human participants has been performed in accordance with the ethical standards of the Declaration of Helsinki and its later amendments. A waiver for patient written informed consent was obtained for this study.